FastestVPN is reaching the summit of excellence by flawlessly exceeding all expectations that a customer has from a VPN service. The company is based in the Cayman Islands where there are no data retention laws and thus has a strict zero logging policy that it so religiously practices. Within a very short time span, the VPN service has managed to provide rich features with great service. Going over the pros and cons, we’ll have a clearer picture of why FastestVPN is the right choice. From all the VPN reviews that we have done so far, it is safe to say that FastestVPN is most definitely top of the line VPN service provider with outstanding performance. We’ll walk through FastestVPN’s capability with you so your opinion is aligned with ours. FastestVPN offers 3 pricing plans to choose from. In our FastestVPN review, we tested the purchase process which is a simple 3-step procedure. FastestVPN’s pricing policy is easy on the pocket but the best part is that even though it is a cheap VPN, there is no compromise on the service. If for any reason the customer does not find the service satisfactory, which is unlikely, they can put their issue forward and get a refund with their 7-day money back guarantee – no questions asked. FastestVPN allows flexibility in payment. The payment methods allowed by FastestVPN include Credit Cards (VISA, MasterCard, and American Express) and PayPal. You can select any method that is most convenient for you. Once the payment has been made, the process is completed. You will then be sent an email, on the ID provided by you, with login credentials. Next, you just have to enter your credentials on your downloaded app and you’re set. The credentials can also be entered in the client area on the website (www.fastestvpn.com/login) where you can check your billing status, unpaid invoices and change your password. The payment process is also secured and your information is safe when the transaction is made. FastestVPN does not have or retain any user information whatsoever. The only information the company holds is the name and email address that are provided by the users themselves at the time of sign up. PPTP is easy to use, easy to setup and cost effective. Though it is the least secure VPN protocol and outdated, it offers a decent speed as compared to other VPN protocols which are great for streaming content. It is supported by older operating systems such as Windows XP. This protocol is also supported by a large number of Wi-Fi routers. L2TP is a successor to the PPTP and is usually combined with IPSec protocol which creates a highly secure VPN connection. L2TP is faster and easier to configure with most firewalls. OpenVPN UDP is faster than TCP. It is the recommended protocol for streaming media, VoIP, and online games. OpenVPN TCP offers a more stable connection than UDP, therefore, recommended for large file sharing and downloading. OpenConnect works with Port 443 and thus work effectively with any firewall or other blocking systems without any additional configuration. It is very effective when connecting to a corporate network due to the restrictive environment. This protocol is an IPsec-based tunneling protocol that is developed by Microsoft and Cisco. It is comparatively faster than L2TP, and PPTP. It doesn’t support old platforms like Windows XP but is excellent for newer ones. FastestVPN offers this protocol for higher security for online transactions such as bank transfers and more. IPSec is a highly secure protocol supported by Apple Mac and iOS devices. IPSec is the best option for those users who need to access a remote location such as their office network. FastestVPN offers security features that are enabled by default upon connection. They allow you to access the online world freely with added security and without any stress. Such features are Malware protection and NAT Firewall. Along with these added layers of security, there is the Ad Blocker feature as well that blocks any pop-ups or frustrating ads that show up on your screen out of nowhere. What’s the cherry on top? These are not treated as add-ons and included in all subscription plans without any extra charges. With prices as low as $2.08 per month, FastestVPN is an exceptional catch. FastestVPN has P2P optimized servers which bode well for large file sharing at high speed and unlimited bandwidth. Be assured to be shielded while you download content to your heart’s content. FastestVPN allows you to connect up to 5 devices at one time with a single subscription. Which means that you can secure your personal computer, laptop, phones, and tablet all at once. FastestVPN is compatible with 20+ devices and has dedicated apps for Windows, Linux, Mac, Android, iOS, Android Box and Smart TV. You can also configure it with the router to secure devices that there are no specific apps for, such as Kodi, Xbox, PS4, Roku, Apple TV and more. FastestVPN apps are easy to use and pretty straightforward. Their apps are subscription based and can be downloaded easily from the website directly or through the device store (App Store, Google Play, etc.). The interface of the app is dynamic and proved satisfactory when tested. The mobile and desktop app is what we tested thoroughly. It was responsive to each click and was super fluid in terms of performance. The browsing and downloading after the connection was also quick. The server list is also easily accessible from the app for the user to choose and connect to the best servers available. Overall, both performance and usability can be rated as excellent for desktop and mobile apps, and the same holds true for other platforms as well. Speed tests were conducted for FastestVPN’s servers to gauge the performance. In this FastestVPN review, we are including speed test of the UK server. Without FastestVPN connection, the ping, download and upload speed are as below. With FastestVPN connection, the speed of all three changed to the following. The ping has shown an increase considerably which can be due to the distance from our location to the server. The upload speed has no major changes and is still pretty good as encryption has relied heavily on data upload speed. However, the download speed is almost the same with no significant changes which mean it is still as fast as it was without FastestVPN. That weighs in the favor of users who especially use a VPN to torrent anonymously and download large files with privacy. FastestVPN has worked out a four-pillared customer assistance for all its existing and new clients. It includes FAQs, setup tutorials, email support and 24/7 live chat. The website is knowledge-based with VPN setup, router configuration, manual setups and other tutorials provided step by step. FAQs also have detailed information about queries that address the majority’s concern. Email support is quite active and responsive, though the crowning glory of FastestVPN is their 24/7 live chat which response to concerns of each customer in real time without any bots involved. There is always a dedicated representative present to help with any issues that may arise. They are online round-the-clock without fail. User account related problems take slightly longer than setup assistance and troubleshooting. Commonly loved and preferred medium of file sharing is torrenting and P2P. An individual can download any media content that they are interested in via torrent websites. TV shows, movies, music, documentaries, games and more can be acquired through torrent websites. The only flipside to this facility is that there are strict anti-piracy laws that are controlled by DMCA acts which can sometimes cause the torrenteers to pay hefty fines or serve jail time in extreme cases. This is where the benefits of a VPN weigh in and is advised to get a VPN so you can torrent fearlessly. Evaluating FastestVPN service draws to the conclusion that the VPN is definitely worthy. It is great for all use cases – from an individual with personal use to a company using it for secure communications and business transactions. Its advanced features at affordable prices set competition high in the market. 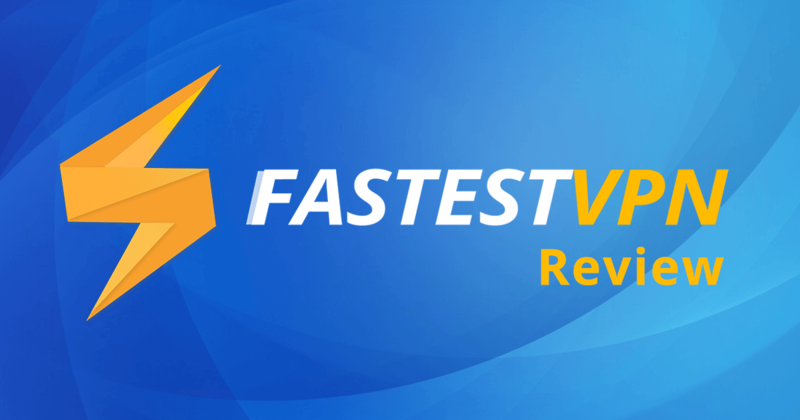 This FastestVPN review depicts that the fastest VPN service prioritizes customer comfort and provides them with premium service and support that they paid for.